You can submit URL to the MoreFunz. Submission order will be considered for a week. Please, don't submit a URL multiple times. Unfortunately, we do not report a results. Listing is free for non-commercial and paid for commercial websites. If there's questions during submission process you can ask us through Contact page. Before submit URL (website) please do a search - possibly your website is already joined. Try Submit a URL to the Google search engine by the URL submission tool. The Google Search Console provides you a way to submit new URL of your website. This submission tool helps to Google's crawler bot fetch a website. Google will index page of website, then it could be included into Google's search results. Also page can be indexed by Google's regular URL discovering process. Let's to see Google's URL submission process. Please follow to Google Search Console page. Submit URL a first way. Submit URL by URL inspection option in Overview tab. The crawling process of the page can took a day. If everything is OK Google search engine will get your website page into search result. Otherwise you'll get crawl error. When URL inspection is done and page isn't in Google Search there's able to use a Request Indexing option. You might study FAQ and Privacy Statement pages. Fill fields in English. If language of the page differs, make the description in English. We accept already working websites. We don't accept sites of: adult content; calling for violence; calling for racial and religious hatred; calling for humiliation of the personality; with the unsafe contents for children; phishing or fraud. See FAQ. You must have a email address for contact. Accepted sites that 1 Year old or more. Our Web Directory recommend to use at submission a clear description and keywords. It helpful for SEO. 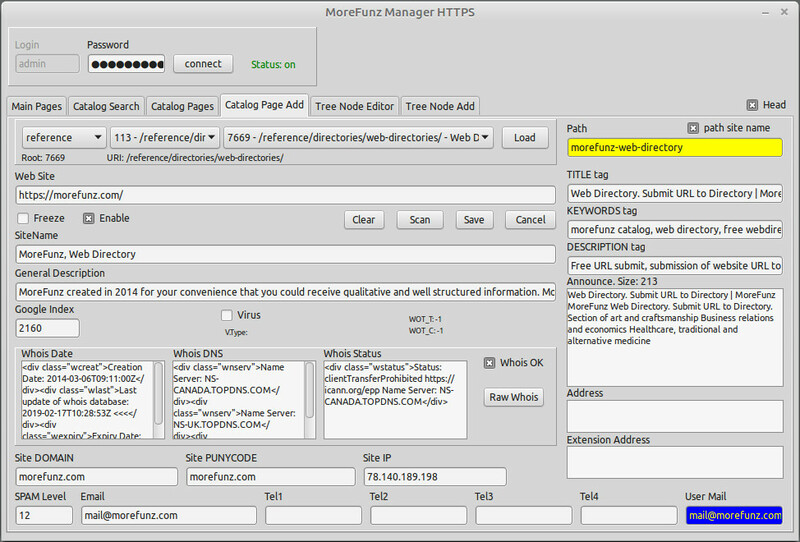 MoreFunz web directory uses the MoreFunz Manager HTTPS application to process submission orders. It automates the process of checking sites. The checking website for a many features. URL - http://example.host/ or https://example.host/, 10 chars min. URL submit. Short description of the website (company). The minimum: 200 chars or more. Current: 0 chars. FULL post address: office, house, department, part, street, city, country. Additional information about the address, operating time, contact person, etc. You can specify conditions or requirements, proposals for the directory tree, etc.